CRUD is the acronym for Create, Retrieve Update, Delete. Symfony2 has their own CRUD generator that is so simple that hardly anyone uses it. Fortunately, there is really nice Symfony2 CRUD generator which extends default SensioGeneratorBundle and add a paginator using PagerFanta and filter support using LexikFormFilterBundle. In the next few lines of code i will show you how to create (generate) full feature user bundle in just 5 minutes (maybe less). Generated code will be easy to extend and modify – there is no magic. Don’t you have Composer installed yet? During the installation you will be asked for application database configuration – please provide proper parameters. For mailer configuration confirm default settings. Notice: you will be also asked if you want to generate Acme demo bundle but we do not need it in our project. $ cd sfSampleCrudApp $ composer require "jordillonch/crud-generator"
Now we are ready to start generating process. This will generate user entity in no-interactive mode with some fields. Notice: I prefer generating bundles, controllers, forms and entities in interactive mode. For me it’s just more convenient but in this example I wanted to show you that there is also –no-interactive option. You can now start using our brand new generated user CRUD. 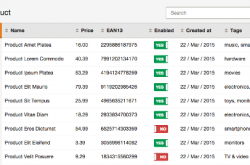 Controller, entity, form / filter and views code can be extended and modified. This bundle can be combined with e.g. FOSUserBundle to provide user authentication and authorization or with GenemuFormBundle for extra widgets. Would it be possible to create a crud bundle with table joins? 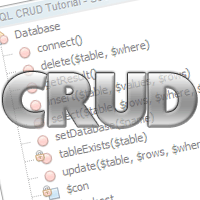 Create a crud bundle to display UserId, UserName, UserAddress. Almost everything is possible as long as this is the just PHP and Symfony2 code. Generated code can be extended and modified. You can simply add extra joins to QueryBuilder and modify form or Twig template to display more properties. You were absolutely right, the code is fully customizable and once you get a good understanding of how the code is structured, you can do pretty much anything. I managed to edit my db query with multiple joins, I also added sorting functionality by clicking on columns and other minor upgrades that matched my needs. When I’m trying to display a db table with lots of rows (let’s say about 10 millions), it obviously takes a very long time to load; so I was trying to set a limit in the query. I tried to add a “->setMaxResults(100)” to the query builder on both the paginator() query and the filter() query, but seems like they are ignored and it still returns all data. I’m not sure if this is the right approach. SELECT ..... FROM myTable p0_ ###no limit here... why? Do you have any idea how to add a limit to the result in order to speed up the data retrieval? Or any other suggestions how to deal with big tables? I think the problem is not in PagerFanta bundle and also not in paginator implemenatation: DoctrinePager which is used for pagination in DoctrineORMAdapter (check: https://github.com/whiteoctober/Pagerfanta/blob/master/src/Pagerfanta/Adapter/DoctrineORMAdapter.php#L14). this CRUD has delete function ? and there is CRUD that allow to ‘move to trash can’ ..
As you can see in source code: https://github.com/level7systems/sf2-crud/blob/master/src/Demo/UserBundle/Controller/UserController.php#L260 there is deleteAction method but it’s not displayed on the user list page by default. You can add it manually or delete user from show / edit actions. perfect tutorial , I’m learning now about the ‘ symfony ‘ and his tutorial was the one who helped me .